The Denver Newspaper Guild attempted to buy an advertisement in The Denver Post stating the Guild’s position on the latest job cuts announced for The Post. We were initially given the price of $6,450 for a quarter-page ad to run on Tuesday, March 20. Today we received word that the newspaper will not run the ad. 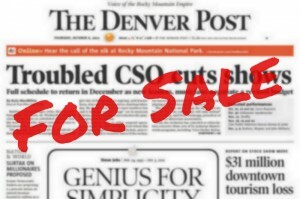 Outside investors who own The Denver Post said last Wednesday they plan to slash a third of The Post’s newsroom staff, the latest in a series of staff reductions that now threatens to destroy the state’s largest newspaper, a 126-year-old institution in Colorado. We demand that Denver Post owner Alden Global Capital sell the newspaper to local interests who care about this state and the role that vibrant, independent journalism plays in its civic life. With the latest announced cuts, The Post’s roster of non-management journalists will shrink to 49 from the 200 who staffed the Post newsroom only seven years ago when Alden Global assumed control of the newspaper. This slow strangulation of The Post should be of concern to all Coloradans who value the responsibility that media have to report comprehensively on government, education, business, politics, sports, the arts and other affairs of the community. Alden Global’s callous hollowing out of The Post has grievously wounded the newspaper’s ability to play that role. In Philadelphia, philanthropist Gerry Lenfest created a unique nonprofit foundation to be the parent of the two Philly newspapers, the Inquirer and Daily News. The purchase of The Washington Post by Amazon’s Jeff Bezos has enhanced its position as one of the country’s best newspapers. Colorado needs business and philanthropic leaders to similarly step up and save The Denver Post. We ask Post readers to contact Alden Global Capital at 885 Third Ave., New York, N.Y. 10022, (212) 888-5500, to convey this message: Sell The Post to owners who care about local journalism and our community. Thank you for sharing this with our community. Clearly Alden is in control and the local folks have no say. I attempted to call Alden Global Capital this evening and they provide no way to leave a message unless you know a specific person there. And Randall Smith is not even in the directory, likely for this very reason. Can you provide us with a way to reach a person or functioning voice mail so we can promptly let them know what our citizens think about their approach to our paper of record? I just discovered that while Randall Smith has no voicemail box available to the public, Heath Freeman does. Fill it up! You should start a petition, or collect petitions to present Digital First Media and Alden Global. I don’t care to release any personal contact information to either entity. You need to form a worker owned cooperative! You cannot continue to rely on owners who are only in it to make a profit. Hook up with the Rocky Mountain Employee Ownership Center and figure out a way to get a loan to purchase the newspaper from its current owners. I hope some wealthy person, company or organization will step up to the plate to keep this great newspaper. Having lived here since 1984, The Post was one way I became acquainted with the city and surrounding areas. I rely on it for national and local news, the lifestyle section of cultural activities and the inserts. My Sunday mornings would not be the same without it. With the diminishing staff, the quality and accuracy of the paper cannot continue at the same level we have come to expect. Some great ideas. Denver is a first class city and we deserve a first class newspaper. Obviously we have plenty of business people in our city who could buy the Post and improve it. At first it might just be a tax right off but could likely turn a profit after time. What a great thing someone could do for their great city. We aren’t used to second class in any way.